PCOS is short for Polycystic Ovary Syndrome. It is a common disease affecting 20% of women in the UK. Therefore the likelihood of you being affected by it, or knowing someone who is, is quite high. PCOS is a hormonal condition and it is a combination of different symptoms. These can include irregular periods, problems getting pregnant, weight gain and acne. It typically occurs during teenager years or young adulthood. Scientists believe that PCOS is the result of an imbalance in hormones. The two major problems in PCOS relate to the levels of insulin and androgens. Insulin is responsible for keeping blood sugar levels in check. It moves sugars into cells so that they can be used as energy. This is why it is such an important hormone in diabetes. But women with PCOS are commonly resistant to insulin. This means that their bodies are no longer affected by the normal levels of insulin. As a result of this, their bodies have to step up their game and produce even more insulin in order to have any effect. Insulin resistance causes weight gain. But fat also causes the body to produce more insulin, so the process becomes a vicious cycle. High levels of insulin cause the body to produce more testosterone, and this causes its own set of problems. Androgens are generally known as ‘male hormones’, and they include testosterone. But this is not the whole truth. Women do produce androgens in their bodies in small amounts. But women with PCOS produce too many androgens. As men don’t ovulate, you can imagine what the result of high levels of testosterone in women with PCOS might be. That’s right- high testosterone levels interfere with ovulation. Specifically, testosterone gets unnecessarily involved in the development of follicles. Sort of like mansplaining but for eggs! This means that the eggs don’t develop as usual and normal ovulation cannot occur. Another unwanted effect of excess androgens is a distinctive symptom of PCOS called hirsutism. This is the term for excessive hair growth and in PCOS this can commonly affect the face and back. Scientists believe that there is a genetic component to PCOS, which explains why it can run in families. This means that if your mother or aunt has PCOS, there is a higher chance that you could develop the condition too. Scientists are still identifying the exact genes responsible. They believe that these genes are linked to important processes in PCOS such as insulin signalling 1. PCOS is a condition which can present itself in different ways. Not every woman will have the same symptoms. Often, women will have very different combinations of symptoms. Problems with periods. Periods may be irregular or women may have no periods at all. Problems getting pregnant. Many women are diagnosed with PCOS when they have been trying for a baby for some time. PCOS is one of the leading causes of infertility in women. Weight gain. This in turn increases the risk of developing cardiovascular disease and diabetes. Hirsutism, which means excess and unwanted hair growth. This commonly affects the face. Hair loss and thinning hair. Adult acne. This tends to affect the face, back or chest. Obstructive sleep apnoea 2. This is a condition where the throat muscles relax during sleep, and this can result in snoring. Mental health problems including anxiety and depression. The bad news is that there is no cure for PCOS. However the good news is that there are ways to manage the symptoms and reduce how much they affect your day-to-day life. 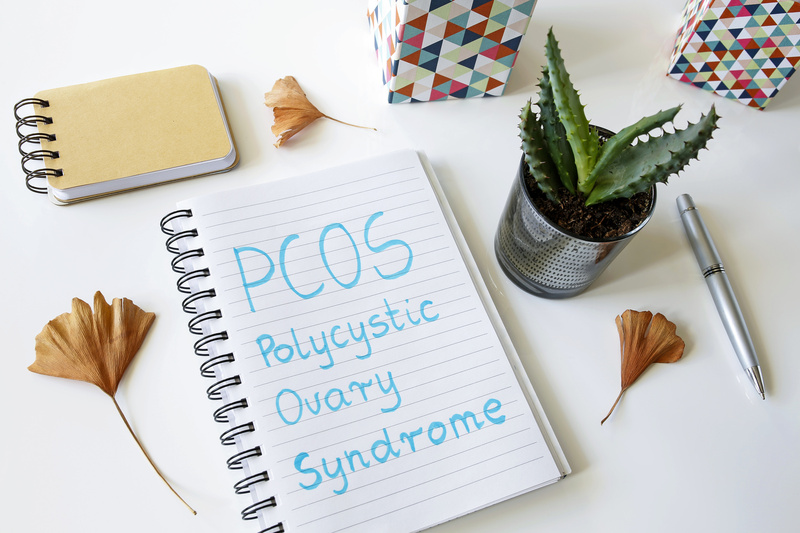 As these treatments do not cure the underlying cause, women with PCOS will need to tailor their approach to tackle each symptom they have individually. In overweight women, weight loss can really help to reduce the symptoms of PCOS 3. Any weight loss can help to improve fertility and restore regular periods. Additionally by losing weight and having a healthy BMI (Body Mass Index), women can reduce the risk of developing diabetes and other health problems. It is important to eat a balanced diet and include foods with a low glycaemic index (GI). These will make your blood sugar levels increase more slowly and these foods include vegetables and wholegrain foods. For more support, speak to your GP who can put you in touch with a dietician. There are a range of exercise options from swimming to dance and yoga. By finding a new hobby, this can help boost your mental health and wellbeing too. These will depend on your symptoms. By discussing these with your GP, you can work out the best course of action and take into account the side effects of each option. Clomifene citrate is prescribed to stimulate ovulation in women with PCOS to help them get pregnant. Metformin is a medicine used by patients with diabetes, and it helps to lower insulin levels. In women with PCOS, metformin can stimulate ovulation and regular periods. It can also help to control other symptoms including acne as it lowers the levels of androgens. Birth control pills can help to rebalance hormones in PCOS and regulate the menstrual cycle to restore regular ovulation. They can also help reduce acne and hirsutism. Orlistat can help patients lose weight 4 if lifestyle changes have not worked effectively. If other treatment options have not worked, your doctor may suggest surgery. Laparoscopic ovarian drilling sounds very invasive, but it is a type of keyhole surgery. During the procedure, a surgeon uses an electric current to make tiny holes in the ovaries. This improves fertility by reducing the amount of androgens produced by the ovaries, and as a result women have more regular cycles. PCOS is a common condition affecting many women worldwide. Women experience different symptoms and the severity of these can vary, with the most common symptoms including fertility problems, weight gain and hirsutism. There are many options available to help women manage their symptoms, and it is best to discuss these with a medical professional.